Will the Mullahs' Missiles Backfire? Home » Perspectives Papers » Will the Mullahs’ Missiles Backfire? Will the Mullahs’ Missiles Backfire? EXECUTIVE SUMMARY: Important new Middle East developments give the US and its allies a real chance to push back on Iranian hegemonic ambitions in the Middle East. Key to this effort will be Congressional focus, not just on the Iran nuclear deal, but on sanctions legislation to undermine both Iranian missile proliferation and terrorist-supporting activities. The Trump administration’s refusal to certify that the Iran nuclear deal (the 2015 Joint Comprehensive Program of Action, JCPOA) is in American national security interests served as the impetus for Congress to take fresh action. By sending a strong message to Congress to look again at the nuclear deal, the president shifted Congressional attention to Iran’s missile proliferation and missile program. Surprisingly, a majority in Congress appear to agree that the 2015 deal erred by letting Tehran off the hook for its missile threats, human rights violations, and support for what Secretary of Defense James Mattis calls “terrorist mayhem” throughout the Middle East. A parallel House and Senate effort has added special sanctions against Iran for its export of missiles and missile technology, including to the Houthi rebels in Yemen, but also for Iran’s related terror support. 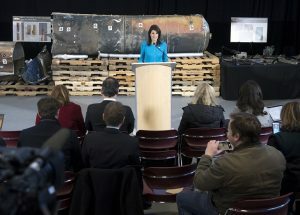 In a stunningly effective presentation at Bolling USAF base, America’s UN Ambassador, Nikki Haley, displayed recovered Iranian missile parts that had landed in Saudi Arabia. Finally, in a related matter, the split from the Houthi rebels of forces loyal to former Yemeni President Saleh gives hope that the war in Yemen can be ended – and with it, Iran’s quest for hegemonic control of a key geographic bridge to control two critical waterways, the Persian Gulf and the Red Sea, through which millions of barrels of oil move each day. Ambassador Haley’s news conference proved with little doubt that hundreds of missiles launched against Saudi Arabia over the past two years are, as she charged, “Iranian-made, Iranian sent, and Iranian given” to the Houthi rebels in Yemen. Noted Iran expert Ken Timmerman reports that Haley presented the components of two Scud-class 37-foot-long missiles as evidence that Iran is violating the terms of its nuclear agreement, especially UN Security Council Resolution 2231. The missiles were fired from Yemen and targeted King Khalid International Airport in November 2017; Yanbu, Saudi Arabia in July 2017; and, most recently, the Royal Palace in Riyadh in December 2017. US intelligence agencies said that manufacturing marks inside the missiles tie the systems to Iranian defense industries, and that welding on the missile parts shows that they had been taken apart to transport them inside Yemen. Yemen’s Houthi rebels claimed responsibility for the launches. The Houthis are in a civil war with the Yemeni government and have been targeted by a Saudi-led and US-supported air campaign. While the Iran nuclear agreement itself does not specify any limit on ballistic missiles, the supporting UN resolution calls for Iran to also halt its ballistic missile production. Timmerman accurately notes that until the Haley news conference, no one had held Iran to account for the Houthi missile attacks against the Saudi nation. Thus, the joint effort by the State and Defense Departments deserves praise, and illustrates in real time the strategy enunciated by the newly released National Security Strategy of the US. Under the previous administration, as Timmerman explains, such attacks were attributed to the Houthis only, even when they directly targeted US warships. “Ambassador Haley’s press conference, and the backup she received from the Pentagon, suggest a significant shift in policy from the Trump administration,” he said. Complementing the administration’s campaign are parallel efforts in Congress to push back hard against Iran’s missile proliferation and terror support. Many wide-ranging new bills are now being considered by Congress, some of which have passed each chamber, to significantly ramp up sanctions against Iran. A bill from Senate Foreign Relations Committee Chairman Bob Corker (R-Tenn.) and Sen. Tom Cotton (R-Ark. ), is intended to address issues they see as related to the nuclear deal itself and the announcement weeks ago by the president that the Iran deal is no longer in the national interest of the US. Congress is also contemplating other key Iran sanctions bills, including legislation sponsored by Republican Rep. Elena Rose Lehtinen of Florida and Ted Poe of Texas, senior members of the House of Foreign Affairs Committee, to sanction Iran for supporting the Houthi rebels in Yemen and for sending Revolutionary Guards and weapons to the Houthis including ballistic missiles. Another bill, first introduced in the Senate by Chairman Corker, would target Iranian individuals engaged in “destabilizing” or terrorist-supporting activities. It passed the House on October 30 by a vote of 432-2. The bill, entitled “Countering Iran’s Destabilizing Activities Act of 2017,” directs the Departments of State, Defense, and Treasury and the Director of National Intelligence to submit a strategy every two years for deterring conventional and asymmetric Iranian activities that threaten the US and key allies in the Middle East, North Africa, and beyond. The bill also requires the president to impose asset blocking and US exclusion sanctions against any person who materially contributes to: 1) Iran’s ballistic missile or weapons of mass destruction programs, or 2) the sale or transfer to Iran of specified military equipment or the provision of related technical or financial assistance. It is now awaiting action in the Senate, and will hopefully be considered part of the overall effort to deal with the Iranian nuclear agreement and the companion oversight legislation passed in 2015. Yet another bill, HR 3320, passed the House on October 25, 2017 and is now pending before the Senate Foreign Relations Committee. It would slap additional sanctions on Hezbollah by limiting assistance to groups within Syria. Some Americans may acknowledge the Iranian role in what Defense Secretary Mattis describes as Middle East “mayhem” but still believe our fight is not in Yemen but against more pressing problems at home. There are serious problems with such a view, but one will suffice. The Iranian Quds Force Commander is Maj. Gen. Qassem Suleymani. According to Timmerman, “He is the one who has recruited Sunni jihadists in the Taliban and Hamas to join Iran’s ongoing war against the United States and Israel. He is the one who succeeded in recruiting al Qaeda in Iraq leaders to join with Iran in opposing US-led governments in Baghdad, and who supplied explosives and technology for explosively-formed penetrators that killed some two thousand US soldiers in Iraq. An earlier version of this article appeared in The Hill on December 28, 2017. Peter Huessy is the director of Strategic Deterrent Studies at the Mitchell Institute for Aerospace Studies of the Air Force Association. He is also the president of Geostrategic Analysis, a defense consulting firm.